What if you could have great new images without leaving your desk? Perhaps you can because you may have some hidden gems in your existing photo library. Sometimes all it takes a fresh perspective on an old image and a few editing tricks to increase the number of images in your portfolio. 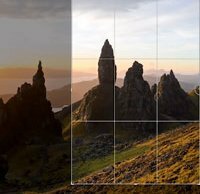 Photographer Nigel Danson believes that the crop tool, while basic and well-known, nonetheless remains an underrated tool for improving your photography. Not only can the crop tool breathe new life into old images, but by approaching existing images with new crops, you can also learn more about composition and then apply that knowledge out in the field when capturing new images. By changing the point of focus in an image by cropping it, you can dramatically change the balance and overall strength of a photograph. Sometimes simply removing some parts of the frame can reinvent an image. In an ideal world, you nail your composition when out in the field. However, there are a lot of obstacles to making a perfect image at capture. Sometimes you don't have the right lens with you and you can't get in a better position with your camera. A great shot may have been right in front of you and maybe you just missed it while shooting. The crop tool can help you overcome these obstacles while also teaching you to be more mindful of different possibilities while shooting. To see more of Nigel Danson's work, visit his website and follow him on Instagram.